WEST PALM BEACH, Fla. -- The Astros and All-Star third baseman Alex Bregman have agreed to a five-year, $100 million contract extension, a source told MLB.com on Tuesday. The deal is tied for the second-highest contract in club history, trailing only the five-year, $151 million contract extension given to former Most Valuable Player Jose Altuve a year ago. Bregman, 24, is coming off a breakthrough season in which he led the Astros in nearly every offensive category and was named to his first All-Star team. He hit .286 with 51 doubles, 105 runs, 31 homers, 103 RBIs, 96 walks and a .926 OPS, becoming the youngest player in franchise history to hit 30 homers. He finished fifth in American League Most Valuable Player voting. 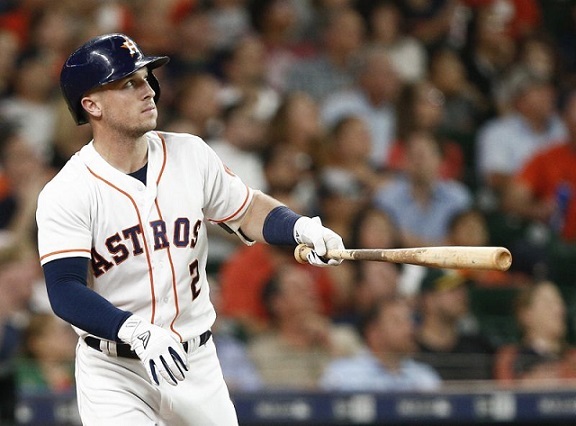 Earlier this month, the Astros renewed Bregman at a $640,500 salary for 2019 in his final year before arbitration, with Bregman disappointed about how that process played out. His extension will cover his three arbitration years (2020-22) and his first two years of free agency (2023-24). Bregman will be entering his age-30 season when the contract expires. The Astros have locked up two of their core four homegrown players, with Altuve signing a deal last year that will begin paying him $29 million a season for five years starting in 2020. That deal also ends in ‘24. Outfielder George Springer will be a free agent after the ’20 season, and Carlos Correa after ’21. The club also agreed to a two-year, $17.5 million contract extension with reliever Ryan Pressly, a source told MLB.com on Tuesday. Before the Pressly and Bregman deals, the Astros had given out only three contract extensions since Jeff Luhnow took over as general manager prior to the 2012 season. They signed Jon Singleton to a five-year, $10 million deal in ’14 and gave Altuve a new deal last year. Altuve also signed a four-year extension in ’13 with two club options that bought out his first two years of free agency. As salaries among star players explode across MLB, with recent deals to marquee names Bryce Harper (Phillies) and Manny Machado (Padres) in free agency and extensions to Nolan Arenado (Rockies) and Mike Trout (Angels), the Astros have locked up one of the game’s up-and-coming stars at a relative discount. Trout’s extension is worth $426.5 million for 12 years; Arenado, also a third baseman, signed an eight-year, $260 million extension earlier this year. Harper signed for $330 million for 13 years, and Machado signed for $300 million for 10 years. The Astros are going to face challenges keeping their current team together beyond this year, though, with starting pitchers Justin Verlander, Gerrit Cole, Collin McHugh and Wade Miley all facing free agency. Cole called Houston “a wonderful place” at spring camp and said he’d be open to anything. Drafted second overall out of LSU in 2015, Bregman zoomed through the Astros’ system and made his debut in ’16 before a solid first full season in the big leagues in ’17. He hit .284 with 19 homers and 71 RBIs that season and delivered a walk-off single in Game 5 of the World Series. Bregman’s ’18 season was remarkable. He led the Astros in runs, hits, doubles, homers, RBIs, walks, on-base percentage and OPS and led the Majors in doubles, tying for the third-most in a season in Astros history. He became the first player in MLB history to record 30 homers and 50 doubles in a season while playing the majority of his games at third base. He was also one of three Gold Glove finalists at third base in the AL. Bregman, who was named the MVP of the All-Star Game, also saw his star grow off the field through social media. He launched his own YouTube channel to give fans a glimpse into his personal life. He endeared himself to Latin American teammates by learning Spanish, and created a Twitter craze last year by leading dugout stares into the television camera following home runs. On Tuesday, Bregman was unveiled as adidas' latest MLB star. Earlier this year, Opendorse, an athlete marketing platform, proclaimed Bregman’s total social media engagements during the 2018-19 offseason were the highest in the Major Leagues and more than double of the next highest player on the list, Marcus Stroman of the Blue Jays. He’s already challenging Altuve – the former AL MVP – as the most popular player on the Astros, and now the two will be teammates for at least the next six years.